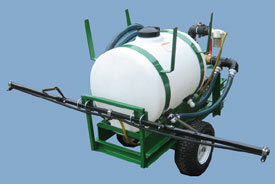 The HS-100, is a 100 Gallon, skid type hydroseeder. It will seed 1300 square feet per load. It is equipped with an 4 H. P. Honda engine that is directly coupled to a 2″ X 2″ high volume centrifugal pump. 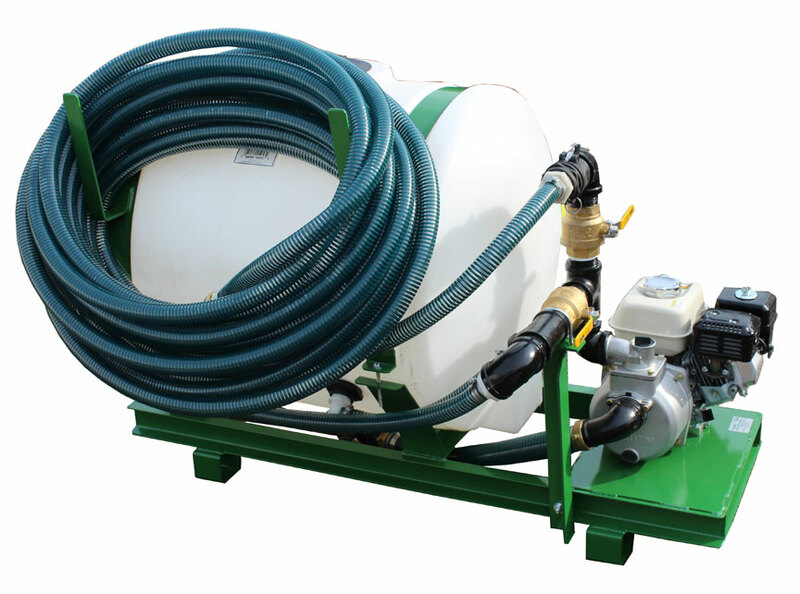 The unit comes with 100′ of 1 1/4″ discharge hose, gun and three nozzles ( 1 wide hydroseeding nozzle, 1 straight distance nozzle, and 1 trim nozzle). The empty weight of the unit is 210 pounds. the loaded weight is 1010 pounds. the physical dimensions are 27″W x 56″L x 33″H. The size of the skid frame on this unit is 20″W x 56″L. This unit will fit in the back of a compact pickup, or a utility vehicle such as the John Deere Gator. It can also be easily operated from a trailer. 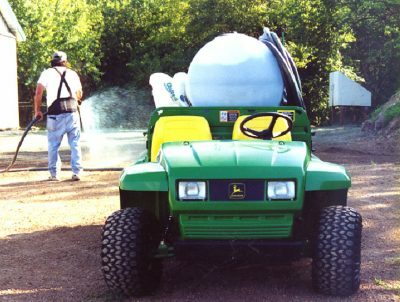 The HS-100 is ideal for installing a new lawns in areas with smaller lawns and for lawn repair and renovation, for a golf course to use in repairing damage along cart paths and for repair projects, for a cemetery, for construction repairs, for someone installing irrigation systems or water lines, It is capable of handling much larger jobs. Material is applied at approximately 30 G.P.M. Time to spray a complete tank is about 3-4 minutes. Mixing time is 2-5 minutes depending on material. This unit comes with 100′ of discharge hose. It will handle an extra 50′ of hose. The spray distance with the straight nozzle is approximately 40′. Typically materials used in one load would be 30 pounds of paper based hydro seeding mulch or 40 pounds of pourable mulches such as Cover Grow or EZ Mulch AF, the appropriate amount of seed for 1300 sq. 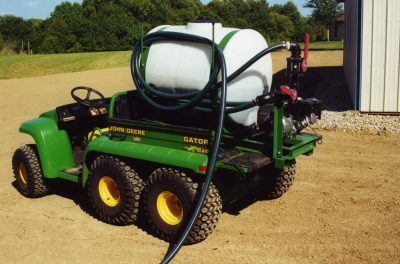 ft. (any seed will work in hydroseeding), and the appropriate fertilizer for 1300 square feet (liquid, water soluble, or granular) and a small amount of tackifer. The HS-100 can not use wood mulches or wood/paper blends. 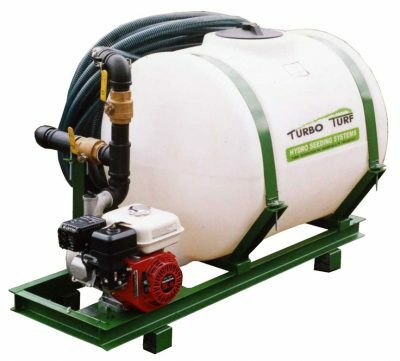 Like all TURBO TURF systems the HS-100 comes equipped with a long life poly tank that can never rust, the ability to mix partial loads, a simple but powerful design with few moving parts, continuous agitation, and the ability to control the flow at the gun without making adjustments at the unit. Prices quoted are a complete machine ready to operate. This unit used a 2″ x 2″ centrifugal pump with an output of –180 gallons a minute of flow and 42 P.S.I. of pressure. We have been using this pump for nearly 20 years and it has provided excellent performance and durability. The housing material is cast aluminum and it is easy to service and maintain. There are no grease fittings and the only maintenance required is to winterize if at the end of the season if it is stored where temperatures go below freezing. The pump impeller mounds on the end of the engine shaft so there is no power loss. Typically it can operate for 5 to 10 years with no maintenance. The only thing to be careful of is to not run it dry. This unit comes with a 4 H.P. Honda recoil start engine. This has proved to be a very reliable engine with a long life. The engine has a two year warranty and service for the engine is available at any authorized Honda engine dealer. The HS-100 is a skid type unit that can be operated from a small trailer, from the back of a pickup truck from the back of a utility vehicle and any other means of transporting the unit. 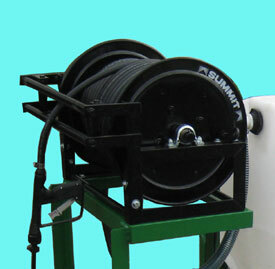 It is available as a pull type unit which is designed for off road use and is not highway legal. For more information on the pull type unit look at our model number HS-100-P.
Coverage (sq. ft) 1,300 sq. ft. The HS-100 can be equipped with a boom to use it as a lawn sprayer when you are not hydro seeding. The HS-100 can also be equipped with what we call a “Seed & Spray” option which is a hose reel and hose for spraying herbicides, insecticides and fertilizers.